Left-Hook Lounge Mailbag: Adonis Stevenson v Badou Jack, Terence Crawford v Jeff Horn, and Some Perspective on European Fighters! Chris M. (Orlando, FL): As a long time fan of Adonis Stevenson, I was surprised at the effort of Badou Jack as I never really rated him too highly. What were your thoughts on the fight and on Badou Jack’s performance? Vito W. (ESB): Prior to the fight I posted on Facebook that we could be in for a potential “Fight of the Year” candidate. As the final seconds ticked off the clock, surprisingly, that’s exactly what we saw. The ebb and flow, the guts on display for glory….just the sheer energy and effort of both men was everything you’d want to see in a main event Saturday night Boxing classic. 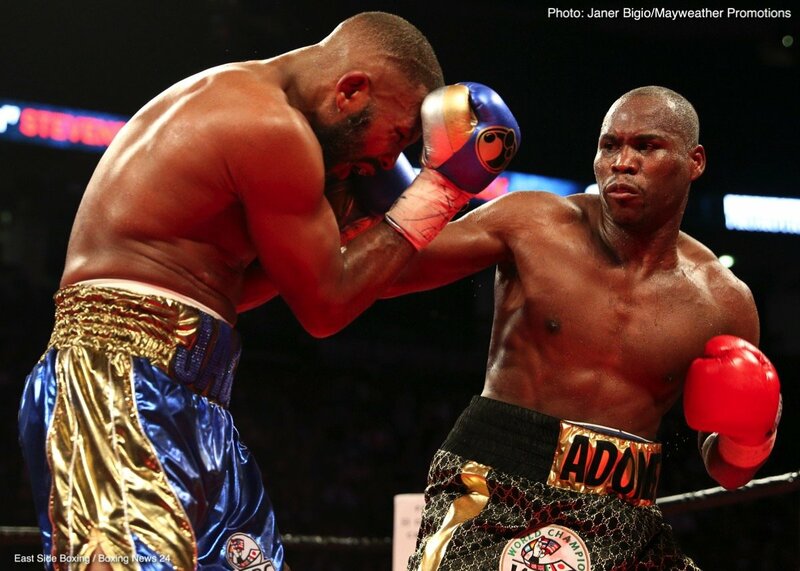 To Adonis Stevenson’s credit, he fought a hell of a fight and used some old veteran tactics when necessary (clinging and clenching) to keep himself afloat. But as solid as Stevenson was, clearly, if Badou Jack had a bit more power, he would have never made the final bell. Jack made Stevenson work for every punch, every second of every round, and I truly commend him for that effort. One thing few seem to discount in Badou Jack’s effort is the presence of Floyd Mayweather and the influence he has on strategy. Mayweather said when the bout was signed that he didn’t know if his fighter would win or lose, but what he did know is that he would have the tools to get the job done when he enters the ring. Jack has never been the biggest or strongest fighter in the game. But what he does have and he has proven this time and time again is a fairly high ring IQ. It’s the Tom Brady effect. Basically his underrated ring IQ allows him to get far more (results) with far less (talent). You place an above average IQ like that in the stable of a Floyd Mayweather – arguably one of the highest IQ’s in the history of the sport – and you’re going to get a certain level of success to follow. Jack executed a very solid gameplan. A great deal of that gameplan involved turning Stevenson, which took most of the steam off the big left! Aside from that, they took a page directly from (what I call) the ‘Mayweather Mantra’, by keeping a safe distance early while racking up points, then closing the gap and picking Stevenson apart. By the mid-rounds we saw Jack capitalize on the early body work he put in the bank and eventually pause Stevenson’s 40 year old legs more and more. Props to Stevenson for weathering the storm and finding a way to keep it close, but Jack was just very impressive. Outside of the now retired Andre Ward, there’s no light heavyweight in the sport that decisively defeats Jack. Derek Edwards was the only style that that produced a bad night for him. We haven’t seen it since, and I’m not sure we will. Aleksander O. (Manchester, England): I think your position on fighters from the Europe region has been consistently critical. Can you explain why you rarely give Euro-fighters the benefit of the doubt? Vito W. (ESB): If I had a nickel for every time a fan accused me of grading some particular countryman on a steeper curve, I’d be a rich man by now! Best place to start with my response is that over the 13+ years I’ve covered the sport, I’ve heard criticism from every angle possible. During the Mayweather/Pacquiao drug debacle, I was accused of being unfair towards Pacquiao, simply because I felt that if he were clean, he should have had no problem lifting his cuff and filling the cup! A few years prior to that, Floyd Mayweather fans viewed me as a ‘hater’ based on several articles calling him out. Most notable being an article penned under the theme of a popular R&B song at the time touching on some of his personal revelations. Entitled “Heaven I Need a Hug” (Is Anybody Out There Willing to Embrace a Thug)? Fast forward a decade later, and the fans of today who don’t care for Mayweather view me as his biggest apologist! If you’ve been around the sport long enough, you’ve seen me aim the mythical ‘barrel’ at each of these guys, as two things are inevitable: One, the fact that they’re going to do something unpopular. Two, the fact that I’m going to speak on it when they do. In recent times Golovkin and Lomachenko fans probably have the most to shout about, as admittedly, I’ve been tough on both. But here’s why: In the case of Golovkin, he’s led by a trainer (Abel Sanchez) whom, for years, has said some very outlandish things to promote his fighter, and they’re all built around deceptive hype. It became pretty telling to me that ending two years in a row, he predicted “next year, Golovkin is going to have a break out year”! (paraphrased). Each of those years were followed by more mismatches where he didn’t quite test himself, or live up to the hype. To date, there’s a strong argument to be made that he still doesn’t own a true signature victory. The Jacobs bout could have gone either way, no rematch granted. Secondly, the Canelo fight was close and ended in a Draw. So with 30+ fights and 30+ knockouts at age 36, and despite all of the hype about power and perceived greatness, he still doesn’t own a sure-fire victory that could be used to punch his ticket into the Hall of Fame. It’s hard for me to support that without criticism. Relative to Lomachenko, I have to give it to him! Every time I’ve said he can’t, he’s proven he can! Which is great! But even that doesn’t support the claims of some who feel that if his career ended today, he’d be “the greatest talent to ever grace the sport”. I just can’t subscribe to that, but I get it! The word “fan” derives from “fanatical”. Those who are “fanatical” about their guy will go hard for them! What’s funny is that I was much harder on Gary Russell Jr., yet never heard a peep! Very critical on Zab Judah and Keith Thurman. Never heard a peep! At the end of the day I’d rather be hated for being honest than loved for lying! But here’s a quick run down that covers the good, the bad, and the ugly (on Euro-fighters)! Mikkel Kessler? Loved the guy! Calzaghe? Not as great as advertised but never got enough respect from the American market! Lennox Lewis? Boring to watch, highly effective! Klitschko Bros: Vitali? Great enough to fight in ANY era of the sport, bar none. Wladimir? Evolved nicely, but not as talented, not as durable. Prince Naaseem Hamed? My favorite Euro fighter all-time! Ricky Hatton? Loved him! David Haye? One of the best Cruiser’s EVER! Should have stayed there! Tyson Fury? If he gets his legs back under him, he could very well be the last man standing! Amir Khan? Fast, skilled, glass jaw! Kell Brook? Special! Best welter not named Mayweather for quite some time! Lomachenko? One of the best talents to grace the sport in the past 10yrs. Not so sure he holds up for the next 10. Froch? Solid fighter, messy style! Joshua? Total contradiction in my mind! He’s the only talent that has ever made me say both, “Has all the tools”, and “there’s still something missing”! I can go down the line, but in the end, just like American fighters and Latino fighters, there’s going to be a mix bag of responses. My best advice for those who feel I’m “unfair” to Euro-fighters? They’re not beyond criticism. Get over it! Marcus N. (Miami Shores, FL): How do you see Terrance Crawford vs Jeff Horn going down in a few weeks? Vito W. (ESB): While I think Crawford will find a way to get the nod, I’ve gone on record plenty of times since this bout was signed to say that I sincerely believe Jeff Horn will give him more troubles than most think. Horn is a very cagey, crafty veteran who knows almost every trick in the book. He has a ton of heart, deceptive power, and is willing to walk through the fire from the beginning and down to the wire! Crawford is going to have to prove his worth on this night! Crawford has shown us that not only does he have a bit of ‘dog’ within him, but he doesn’t have to be pulled into a dogfight to bring it out. This is a fight where he may not have a choice. I love it! Because nowadays we see so many fighters given praise for steamrolling scrubs. This is a legitimate fight, and he’ll be given legitimate praise if he comes out unscathed! Stay Tuned. You are here: Home / Boxing News / Left-Hook Lounge Mailbag: Adonis Stevenson v Badou Jack, Terence Crawford v Jeff Horn, and Some Perspective on European Fighters!